When Ethan’s grandma suggests they take a zip line to school, Ethan realizes that his grandma is a little different. In fact, she’s a ninja! Ethan is soon the hit of the school when his grandma drops from the ceiling at show-and-tell, and teaches the kids karate moves and how to do backflips in slow motion. But when his grandma deflates his team’s soccer ball, everyone is upset—including Ethan. Why can’t he just have a regular grandma? But when Ethan tries out his new karate moves during the championship game . . . he’s happy that his grandma isn’t ordinary. What a fun story! My Grandma’s A Ninja doesn’t come out till March 1st 2015, so keep your eyes open for it! This story has a very relatable message for kids! Sometimes we just can’t control the way others act, and sometimes the ones we love embarrass us, but we love them for who they are and we’d miss them if they weren’t around. I feel like I’m making this book sound much more serious than it is…it’s actually very imaginative and silly! 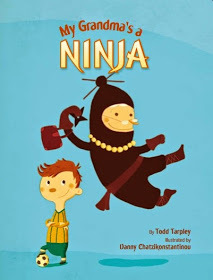 I found myself imagining my family members as ninjas and thinking…”I wish I could bring a ninja to work with me!”. Wouldn’t that make for an interesting day! I loved this story and I can’t wait for the next one by Todd Tarpley to come out……and THIS one hasn’t even been released yet!